Opal with play of color has always been considered one of the most desired gems in the marketplace, earning it the undisputed title as 'Queen of Gemstones'. With the discovery of precious (and stable) opal in Ethiopia's northern Welo District in 2008, coupled with its prolific bounty, this remarkable gem has reclaimed its throne and rules again as one of the most in-demand gemstones in the 21st century. Many Ethiopian opals are hydrophane opal which is porous and will take on water. The SG of stones can be variable due to soaking in liquid or due to the humidity of surrounding atmosphere. 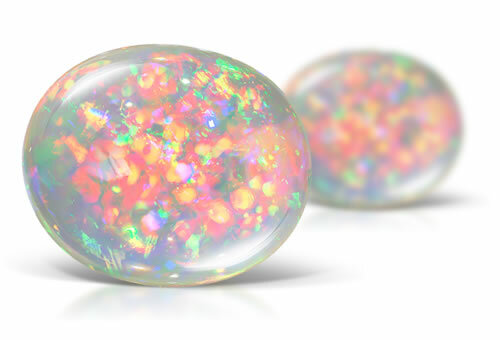 Ethiopian opal will have play-of-color in various patterns, such as pinfire (small patches or dots), flash (large areas of color), harlequin (brush-strokes of color); flagstone and other unique patterns.